It's always interesting when the New York Times promotes a false narrative -- as it has on Ukraine by blaming the crisis all on "Russian aggression" -- and then has to shift its storyline when events move in a different direction, like President Vladimir Putin's recent peacemaking initiatives. "Faced with the threat of additional economic sanctions from Washington, President Vladimir V. Putin of Russia discussed an extension of the cease-fire, which is to expire on Friday, in a telephone call with Chancellor Angela Merkel of Germany, President Francois Hollande of France and Ukraine's new president, Petro O. Poroshenko." "The Obama administration has drawn up plans to escalate sanctions against Russia if it does not back the current peace plan by halting the flow of weapons and fighters across the Russian border. The sanctions could target some of Russia's largest banks, or energy and defense firms." The Times also reported, without skepticism, the unverified allegations that the Russian government is supplying heavy weapons to the eastern Ukrainian separatists who rebelled after violent protests by western Ukrainians ousted elected President Viktor Yanukovych on Feb. 22. The U.S. government has repeatedly made allegations about "Russian aggression" but has failed to present any verifiable proof to support the claims. One State Department attempt, which involved getting the Times to run a lead article citing photos purportedly proving that Russian military personnel were operating in Ukraine, collapsed under scrutiny and was later retracted by the Times. "On Wednesday, Secretary of State John Kerry began a news conference at NATO in Brussels by calling for Mr. Putin 'to stop the flow of weapons and fighters across the border.' Mr. Kerry said that the missile launcher that brought down the [Ukrainian military] helicopter on Tuesday was Russian-made and urged Mr. Putin to call for separatist forces to lay down their arms. A senior administration official said Friday that several tanks under rebel possession had come from Russia." Normally, when one party in a dispute makes an allegation and fails to provide meaningful evidence to support it, news organizations add something like: "However, the claim could not be independently verified" or the Times might have noted that "similar claims by the State Department in the past have proven to be false." There is, of course, an alternative explanation for Putin's recent behavior: that he never sought the Ukraine crisis and surely did not plan it; it resulted, in part, from U.S. and European provocations designed to put Putin in a corner in his own corner of the world; Putin reacted to this Western maneuver but was always willing to compromise as long as the end result was not a strategic threat to Russia. 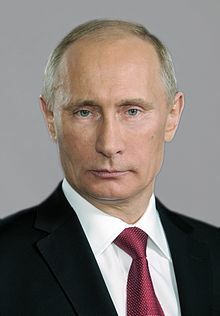 I'm told that Putin, like many historic Russian leaders, has wanted to see Russia accepted as a member of the First World and took personal pride in helping President Barack Obama defuse crises in Syria and Iran last year. Arguably, it was Putin's assistance on those crises that made him a target of Washington's still influential neocons who had hoped instead for U.S. bombing campaigns against Syria and Iran. The Ukraine crisis really emerged from the European Union's offer of an association agreement that President Yanukovych was initially inclined to accept. But it was accompanied by harsh austerity demands from the International Monetary Fund, which would have made the hard life for the average Ukrainian even harder. Because of those IMF demands and a more generous $15 billion loan offer from Russia, Yanukovych backed away from the EU association, angering many western Ukrainians and creating an opening for U.S. neocons, such as Assistant Secretary of State for European Affairs Victoria Nuland and Sen. John McCain, to urge on protests to unseat Yanukovych. In February, as the Ukraine crisis worsened, Putin was preoccupied with the Winter Olympics in Sochi, but he went along with a compromise plan on Feb. 21 in which Yanukovych agreed to reduced powers and early elections (so he could be voted out of office) as well as to pull back the police. That opened the way for violent attacks by neo-Nazi militias who overran government buildings on Feb. 22 and forced Yanukovych and his officials to flee for their lives.